To enter into the Chili Cook-Off and/or the Dessert Bake-Off SIGN UP HERE. Participants must plan to bring a minimum of 12 quarts of chili and a minimum of 50 servings of dessert depending on what competition they’re entering. 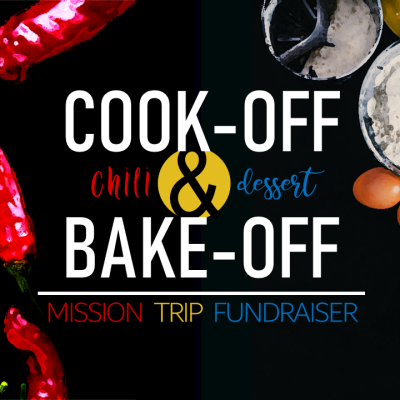 Everyone is invited to come out to FBC for the chili cook-off & dessert bake-off event on Sunday, February 17 from 5-7 PM hosted by the Nepal Mission Trip team. Come enjoy a variety of chili recipes & desserts and then vote for your favorite. Hot dogs and sides will also be served. Free will donations will be accepted to support of FBC’s Nepal Mission Trip this spring.